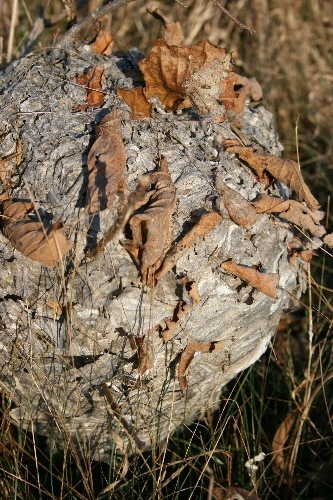 While out walking the other day I discovered a huge paper wasp nest attached to the bottom branches of one of the small bur oak saplings in our meadow. I brought my camera today when I went out to get some photos as I did some investigation. 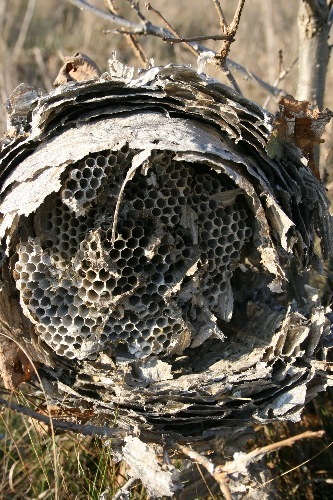 The nest was gigantic, by my sense of wasp standards. I’m used to the little Polistes nests that hang from the ceiling of your garage and such; they rarely get much bigger than a fist, though some particularly enthusiastic colonies might manage to produce one that’s cantaloupe-sized. But this was huge; bigger even than my head. Half the size of Jack. Probably a good 14 inches (35 cm) top to bottom. The lower branches and leaves of the sapling had been completely integrated into the structure of the nest. I don’t often see wasp nests in trees, but I’m pretty sure that all the ones I’ve seen previously hung by a peduncle and didn’t incorporate any tree bits. It seemed funny that I hadn’t noticed this at all during the summer, but the grass gets quite long and it would’ve been well-hidden; I would probably have needed to walk right past the sapling to have seen it before the grass began to die back. Even now, from the main trail it was still hard to detect. Feeling fairly comfortable in the knowledge that paper wasps don’t overwinter in their nests, I decided to open it up. I still used a stick to do it – I wasn’t feeling that confident – but my suspicions were confirmed: the nest was empty. At the end of the summer, the entire thriving colony dies with the frost. Only the new queens, which have already gone on mating flights and been fertilized, overwinter. Next spring they’ll emerge and start building a new nest, tending the eggs themselves until the first brood of workers are grown and able to start helping out. It’s interesting to see all the layers of paper around the exterior of the comb. These provide not only protection against the elements but also thermoregulation; all those narrow pockets of air act as insulation, helping to keep the inside of the nest cool even in the summer heat. I pulled the comb out from the center to have a closer look. 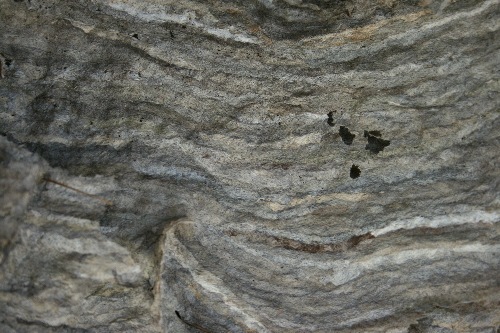 It turned out to be two layers thick, with the second layer separated by a gap of about a centimetre (1/2 inch) or so. Each cell was about 3/4 inch (almost 2 cm) deep and perhaps 1/3 inch (8 mm) across. I’m looking at those cells and thinking: these were big wasps, whatever they were. The cells in typical Polistes nests aren’t that big. All of the cells were empty. The paper that made up the walls of the cells was thin and somewhat brittle, but the two combs seemed to have a reinforcing network of stiff paper arches bracing one comb against the other. You can see a couple here, on the left, looking like swirling flat pieces of paper tucked into the middle of the comb. The ones on the top I don’t think served any purpose yet; I think they were built in preparation for another third comb to be added, but the approach of winter cut short construction. In the very bottom of the nest I discovered a single dead individual, the only one left, caught in a fold of the paper. The identity of the nestmakers revealed: they were Bald-faced Hornets, Dolichovespula maculata. 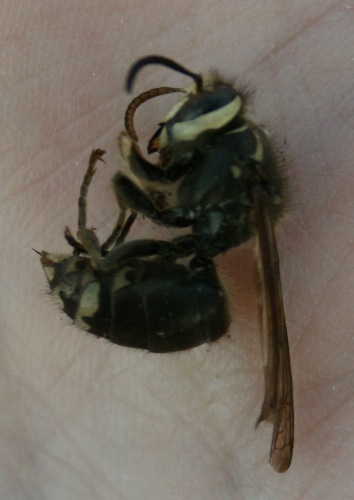 Actually a type of yellowjacket, I believe it’s the only native North American wasp with the common name “hornet”. True hornets are members of the genus Vespa, of which there is only one in North America, the introduced European Hornet (Vespa crabro). Most of the yellowjackets do have a lot of yellow on them, but there’s one species that’s mostly dark and commonly called a Blackjacket. So maybe this would more aptly be called the Bald-faced Blackjacket? The “bald-faced” part, of course, refers to the pale forehead and face (bald being an old english term for this, still often used in describing animals, especially horses). I see a few of these each fall. There’s one in the barn this year. Yours seems about an average size. I got attacked by several of these while standing about twenty feet from a nest. They were very aggressive and very defensive. The stings weren’t bad like being shocked by an electric current but the welts took a couple of days to go away. We have bald-faced hornets here, and some years they make good use of the hummingbird feeders, even chasing off the hummingbirds–The ones here don’t seem to be aggressive, rather, when I refill the feeders, they back off and allow me to do the cleaning and changing. –Interesting. Love seeing these in winter once the leaves are gone. I’ve seen some low ones, but never so low to the ground. Almost all the paper I’ve ever seen is gray like your sample, but I did once came across some that had dark burgundy mixed in with the gray. Wonder what kind of wood that was? It’s faded since then. I’ve also seen these bald-faced wasps hanging out on wooden fences and tree trunks, gathering pulp. I wsa leaning away from the monitor when I got to the bit about you poking the nest with a stick. 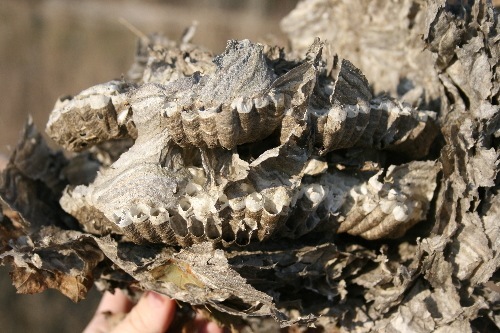 I wonder if it’s possible to recycle the nests into homemade paper? I’m not sure why anyone would, but there it is, pre-pulped. I recently aquired a similar nest and would like to preserve it. The nest is still attached to a branch, which I have brought inside. I would like to display the nest in our rustic home. Does anyone know how to preserve a nest? Enjoyed your adventure poking around the nest. Really is cool how they make it. I have run into quite a few of these on the prairies (sometimes quite literally), often built in Hazel Bushes. They are usually quite well concealed, and perhaps the large leaves protect them from the sun and weather. I have also seen a large wasp catch a horsefly in mid-flight, sting it to death, and consume the entire thing, all in the space of 2 or 3 minutes. There is an old wives’ tale that says if the wasps build close to the ground it will be a dry year. Very nice post. Both your blogs are great. Thanks for sharing all of your experiences in nature. 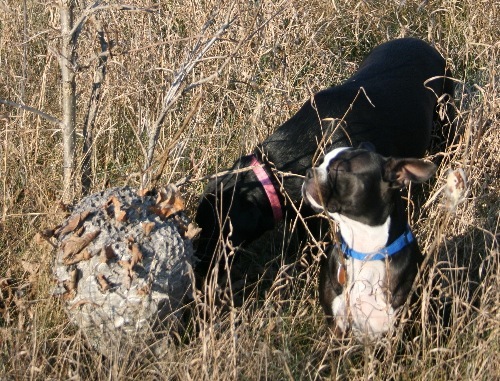 That’s the biggest paper wasp nest I’ve seen! Will you be coming to Florida on your book trip?